This review first appeared in the Winter 1993 edition of Blues Revue Quarterly magazine (now Blues Revue). 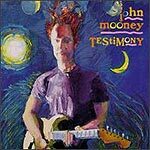 "Testimony" features nearly a dozen Mooney originals, and a handful of tasteful covers (Son House's "Levee Camp Moan," Professor Longhair's "Hey Now Baby" and "In the Night," and Robert Johnson's "Lil' Queen O' Spades"). Backed by one of the funkiest bass masters around, George Porter, and the very capable John Vidocovich on drums, and joined by Dr. John (Mac Rebennack) and Ivan Neville on piano, Mooney turns in his best recorded performance yet. "Testimony" combines the technical prowess that has earned him a loyal following with a larger musical vision of taste and imagination that is likely to bring him wider recognition.